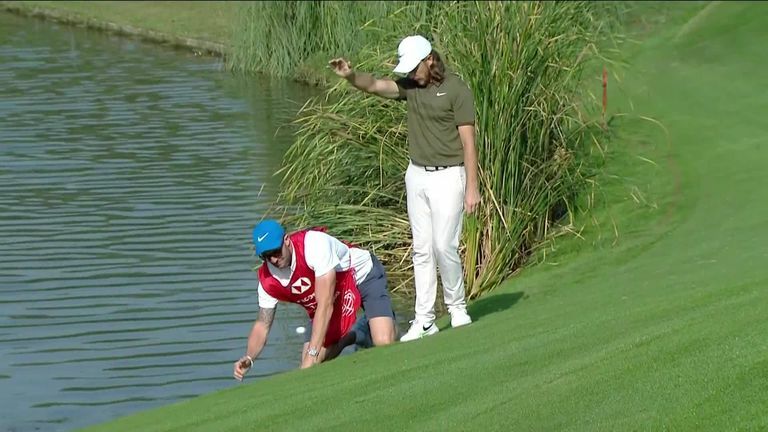 Caddie Ian Finnis attempted a diving catch to stop Tommy Fleetwood's ball from going into the water. Tommy Fleetwood’s caddie was left red-faced after failing to stop his ball from finding the water during the third round of the WGC-HSBC Champions. Relive how Tony Finau retained his three-shot cushion over Justin Rose at the WGC-HSBC Champions. Fleetwood was two under after 13 holes at Sheshan International and just two behind Justin Rose, only to get trouble at the par-five 14th and put his third shot in to the hazard. The Englishman had to take a penalty drop and required his caddie, Ian Finnis, to lurk close to the hazard to try and catch the ball as it rolled back towards the water. Despite being in the perfect position to make the catch, Finnis - the husband of former England goalkeeper Rachel Brown - failed to make connection with the ball and watched it finish in the drink. The pair saw the funny side as they retrieved another ball, although the mood quickly changed as Fleetwood then pitched on to the green and three-putted for a triple-bogey. Click on the video above to see Fleetwood's caddie fail! Watch the final round of the WGC-HSBC Champions on Sunday live on Sky Sports. Coverage begins from 3am on Sky Sports Golf and 5am on Sky Sports Main Event.